Well, here we are, Christmas Day. 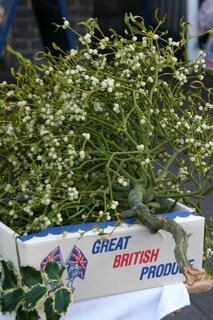 Mistletoe season over for another 12 months (well, not really – am anticipating a lot of mistletoe activity with TEME for Feb/March – marketing mistletoe seeds etc – and also for the London Mistletoe Action Plan, also in Feb/March planting new mistletoe colonies. But it seems like the beginning of a bit of a rest at least. Blog regulars may be disappointed not to have found that picture in the Times in the last few days – either I missed it or it wasn’t in – but no matter, there was good coverage in the Independent’s magazine yesterday (Christmas Eve) which covered the establishment of mistrletoe seedlings at Kew. This is all due to the work of a Kew student – Masaya Tatebayashi, who has been establishing a new mistletoe colony at Kew as part of the London Mistletoe work (see above). Er, that’s all for now. Happy Christmas!! 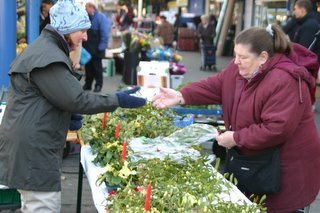 Good mistletoe feature covering all the Tenbury Wells mistletoe issues today – you can read it by clicking here. Refreshingly accurate on most points – and not too scare-mongering. Thank you Paul Kingsnorth. Beats a lot of other mistletoe coverage (though the Independent faeture on 5th? December was good too). And then yes its back to Tenbury again to go up a ladder for some more pics! Andrew Fox, a freelancer who’s already covered the mistletoe and druids for the Times, and who also took the mistletoe auction pic that accompanies today’s Guardian feature, is back again for the Times. Back to Tenbury again – or nearby anyway. 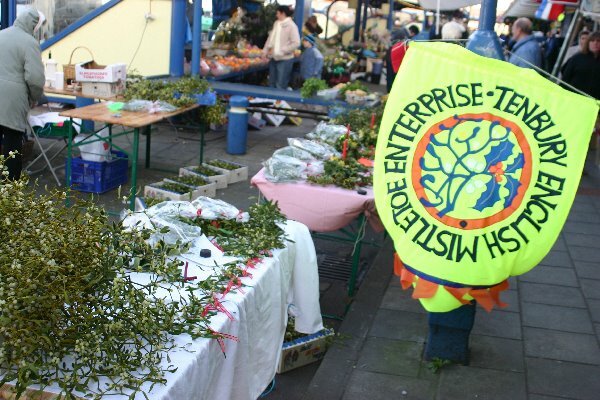 This time to pose for some pics showing how to harvest, and grow, mistletoe. Photographer is Jason Ingram – a garden and landscape photographer who’s done mistletoe before – but is keen to get some more shots for a new portfolio of mistletoe pictures. Jason specialises in gardens, plants, environmental portraiture, architecture, landscapes – so mistletoe harvesting and growing ticks a lot of boxes. Click the link to go to his website. What this means is that I go round a mistletoe-rich apple orchard, up and down a ladder, with my mistletoe-harvesting hook on a pole etc etc. All good stuff, and a beautiful sunny day too. On the basis that ladies are more likely to sell mistletoe than men, Reg, Alec and I sit in the van (and it’s warmer there too). We’re here at the invitation of Newham Borough, who are trying to revive the flagging fortunes of Rathbone Market with a mini ice-rink, Christmas carols, Father Christmas etc etc. 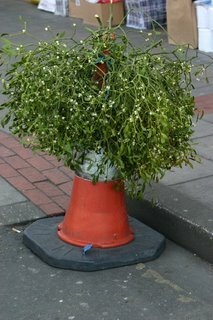 A big operation for us, coming over from Tenbury early this morning with a hired van full of mistletoe – and a bit of an eye-opener. This area is relatively poor, and we don’t get many customers, even after reducing our basic range to 50p. But if you take a walk to the edge of the pitch there’s Canary Wharf and affluent Docklands, just a stone’s throw (ok, several stone’s throws) away. What a difference a bit of water can make. 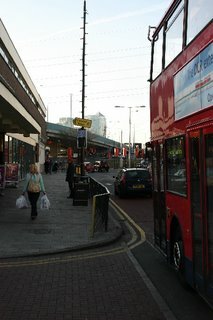 Barking Road is full of buses, and ethnic restaurants. But not people. They seem to be going elsewhere (check out the pic) for their ‘last Saturday before Christmas’ shopping (and why not – they’ve got the whole of London and a working public transport system to use, better than the rest of the UK! But maybe not much cash…). 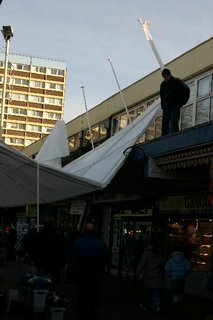 A few probs during the day – which is not only bitterly cold, but subject to the occasional breeze… here’s the carol-singers’ marquee in it’s new upsidedown position above the market stalls. 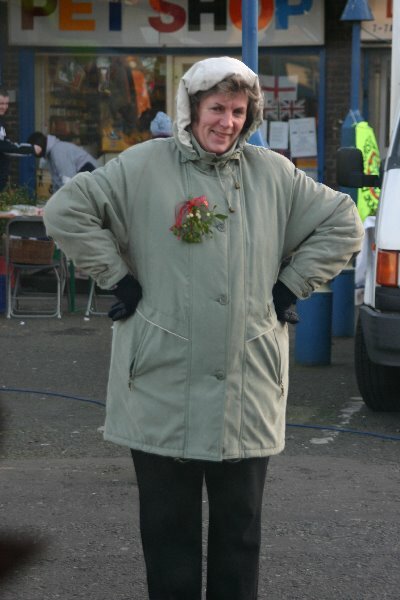 Britain’s smallest commercial radio station and final plans for Saturday…. Now that’s different! Hardly any mistletoe (actually none at all) in their broadcast area, and a station so small it could be mistaken for a shed (or so I’m told). Arranged through my good friend Liz Forrest, one of their volunteer presenters. And a refreshing change from all these big stations darn sarf. Must get up there soon – haven’t seen Liz or Tom for years… will arrange a visit in the new year (and yes Liz, I know I say that every year!). 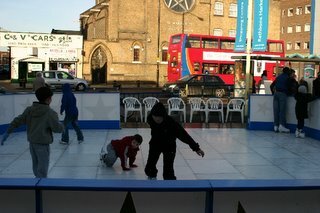 Meanwhile back darn sarf, we’re finalising arrangements for Saturday’s trip to London. 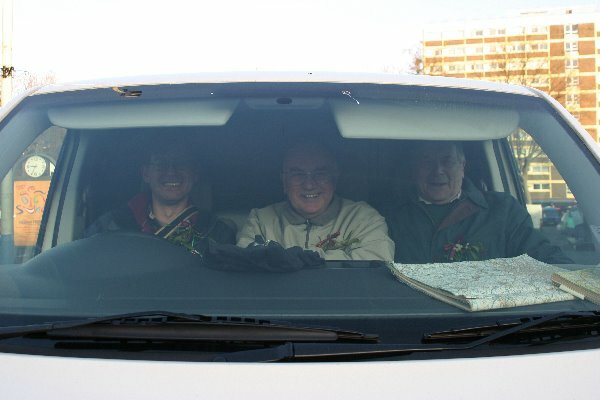 It means I have to miss the office party tomorrow night (sorry Derek) ‘cos I have to drive the van down to London. We’ll be at Rathbone Street Market, off Barking Road E16 – naerest tube Canning Town. Newham Borough have warned us that several local florists are likely to visit – so come along early to get your mistletoe before it’s all sold! 10 mins live on National Radio New Zealand this morning – the evening show there. Bit odd really, talking about mistletoe crises here when they’ve got their own, albeit different mistletoe crises down there (see previous blogs). Not my best radio interview ever – was not sure what they wanted to cover, and so it a was bit unstructured (sorry New Zealand – will do better next time). 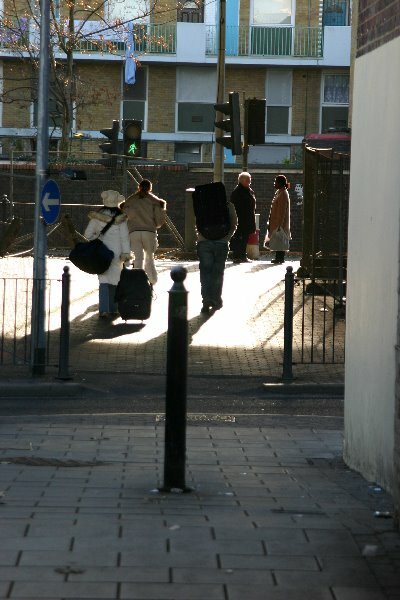 Last market 2005 – where next year??? 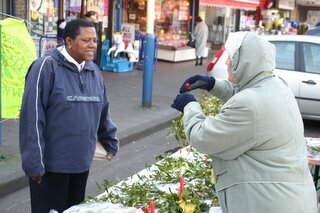 Last mistletoe and holly auction for this year at Tenbury today. Lots of worries about next year and the future of the site. Media out in force (again) – Canadian Broadcasting Corporation have been here since yesterday and now Reuters are here witha film crew – with coincidentally a Canadian reporter. Went off with Reuters to an orchard up the road to talk mistletoe and mistletoe crises. 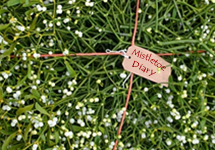 Took the man from the Guardian with us too (talking of the Guardian, Jane Perrone has added a link to Mistletoe Diary 2005 from the Guardian News blog and her own horticultural blog – thank you Jane). Lots of planning for forthcoming mistletoe selling trip to London this weekend (we’ll be at Rathbone Market, Newham, E16, on Saturday… – buy your Tenbury Mistletoe there).